Looking for some on-the-go pampering? Treat yourself to an express facial! Between work and family, it can be hard to find time for yourself. That’s why we offer a range of express facials that are easy to fit into your day-to-day schedule. All our express facials are between 30 and 45 minutes in duration, so you can easily pencil in some much-needed me time. For something sweet and simple, opt for our 30-minute LED Light Therapy. During this luxurious light treatment, we’ll reverse the effects of ageing, sun damage, acne, oiliness, and inflammation. With immediate and visible results, it’s a must-have! For something more comprehensive, try our Signature Express Facial. Suitable for all skin types, this treatment revives, refines and refreshes your skin for a brighter, more vibrant appearance. If you need to target sun damage, blemishes and unwanted pigmentation, then opt for our Glycolic Peel. In this 45-minute session we’ll recondition and balance your skin. For a more extensive treatment, try our Micro On-the-Go treatment. 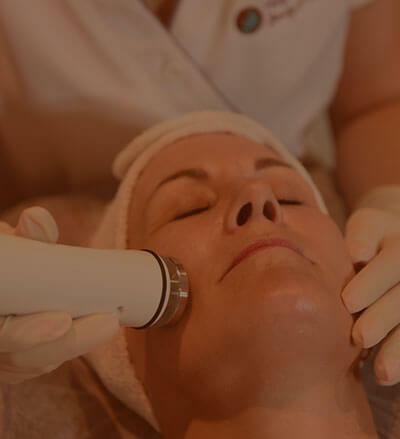 This microdermabrasion facial exfoliates rough, dull and sun damaged skin to give you a smoother and softer feel. For those with acne or oily skin, try out Clean and Extract facial treatment. During this 45-minute session we extract congestion, blackheads and oil from skin to prevent further breakouts. If you’re looking for some quick rest and relaxation, then you can’t go past an express facial. To schedule your very own professional facial, call us or book online. We use proven procedures and high-quality products and to get your skin healthy and glowing.